The Ivester Lloyd prints and pictures for sale below represent a small selection of the Thomas Ivester Lloyd works available. 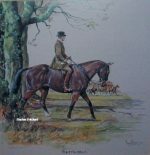 Artist T Ivester Lloyd subjects include Hunting, Racing, Shooting and Military paintings. If there are any prints or pictures by Tom Ivester Lloyd that you are looking for then please contact us on 07889 800857. During the First World War he saw service in France with the Remount Service and was later commissioned into the Royal Artillery. The War Office British Empire Exhibition contains thirty dioramas of battles in British history by Ivester-Lloyd. He married Florence Mary Bunting of Newport Pagnell, Buckinghamshire, where he remained for most of his life. From a child he was involved with foxhunting and beagling and eventually became the Master of the Serrington Foot Beagles. Many people feel his horse portraiture is some of the best of his time. Thomas Ivester Lloyd illustrated a number of books and also on occasion made humorous illustrations. 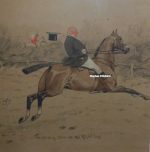 Included in his work are foxhunting and beagling watercolours, and numerous drawings of country life. Amongst sporting art collectors, his work has become as much sought after as many of his contemporaries.